Welcome back to the Iron Leg experience. I hope you all had a chance to download and listen to last week’s edition of the Iron Leg Radio Show. If not, pull down the ones and zeros and give it a listen. I think you’ll dig it. The tune I have for you today is not only very groovy on its own sonic merits, but carries with it the traces of a very interesting back story. 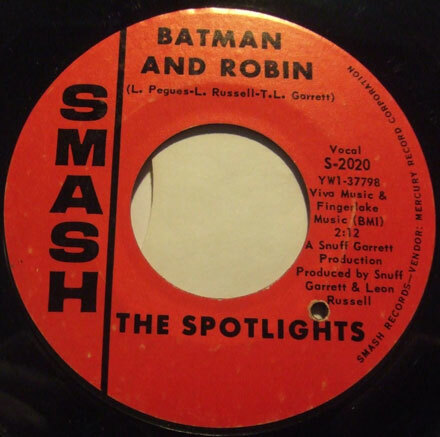 When I was digging at the Allentown all-45 show a while back, I pulled ‘Batman and Robin’ out ofa box of mixed genre 45s, and due to my own fascination with 1966-era, pop art Batman and any musical manifestation thereof, I grabbed it. It was only when I got home and took a closer look at the label that I realized that the disc might have a more interesting pedigree than I figured. The writing of the song is credited to Leon Russell and Snuff Garrett (who were working together frequently in the mid-60s, most prominently on Gary Lewis and the Playboys stuff), but also to a certain ‘L. Pegues’. Now, to most people that name will mean little to nothing, but to dedicated soul collectors like myself, it rings an especially interesting bell. That is on account of the fact that Louis Pegues was the given name of soul giant Lou Courtney, who in addition to making a grip of amazing records under his assumed name, also worked extensively as a songwriter and producer. He wrote songs (first with his composing partner Dennis Lambert) for acts like Freddie and the Dreamers, Leslie Gore and the Nashville Teens, and later (with Bob Bateman) wrote for soul artists like Mary Wells, Lorraine Ellison, the Webs and Henry Lumpkin (among many others). Though I don’t know the specific circumstances of his artistic intersection with Leon Russell, my first instinct is to attribute it to Leon’s ubiquity in the studios of Los Angeles in the 1960s. 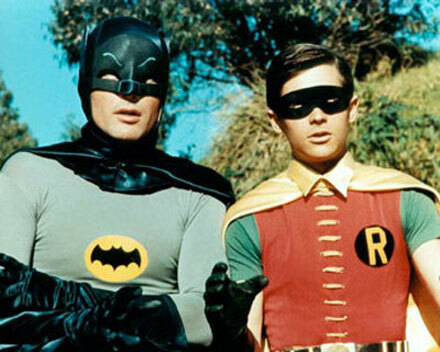 The tune, ‘Batman and Robin’ (released in 1966) is a first rate slice of garagey novelty with pounding piano and organ, comic-book specific lyrics and Leon (I’m pretty sure) on lead vocals. The flipside is a very cool and extremely unusual instrumental called ‘Dayflower’, in which the band performs a mash-up of the Beatles ‘Day Tripper’ and the old bluegrass standard ‘Wildwood Flower’. There was also a full LP by the Spotlights (all comic-related titles) which I’ve never seen, and one other 45 with tracks from the LP (‘Dayflower’ was 45-only). If any of you has any more specific info on the Spotlights, please add on in the comments. I hop you dig it and I’ll see you next week. It’s time once again for the Iron Leg Radio Show, episode 19! This time around we have a great one for you, with three long sets of very groovy music. We get things started with a bunch of garage and other rock, roll on into a set of sunshine and lighter fare, and close things out with a long, trippy grouping of sounds. As always, I hope you dig it, and I’ll be back next week with something cool. Collectors/aficionados of the 60s garage sound (I won’t say punk, since a lot of it doesn’t really edge over into anything resembling authentic punk) know that there were all kinds of small-to-medium-time combos, often making the leap from their parent’s basement, to the local teen clubs and sometimes, if they were very lucky, the recording studio and then the radio. There were also the groups (a much smaller number) that managed to carry that sound onto major (or at least much bigger than local) labels. Sometimes, thanks entirely to an industry that was often run by (or run like it was run by) gangsters, the waters got very, very muddy. Such is the case with the Ohio Express, and the record ‘Beg Borrow and Steal’. I would do this because unlike many of their contemporaries, the Ohio Express were something closer to a brand than a band. ‘Beg Borrow and Steal”, the “group’s” first hit from the summer of 1967 is a dynamite slice of late-period, slightly jangly, organ pounding (?!?) garage pop. 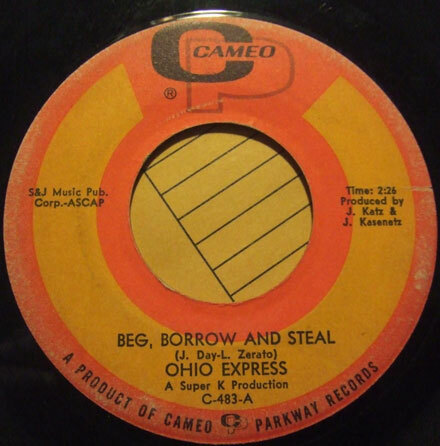 The fact is, that the band that recorded ‘Beg Borrow and Steal’ not only didn’t ever perform under the name Ohio Express, they didn’t even get proper billing on the original 45. When you drill down, the first thing you generally see, is that before Cameo/Parkway whipped this one on the world as by the ‘Ohio Express’, it was released on the Attack label, with the same title, as having been recorded by the Rare Breed. Scratch the surface a little bit more, and it would appear that even the Rare Breed was a Potemkin Village of sorts, yet another layer of falsehood slapped onto a New York group called the Conquests. The connection – as it were – ends there. 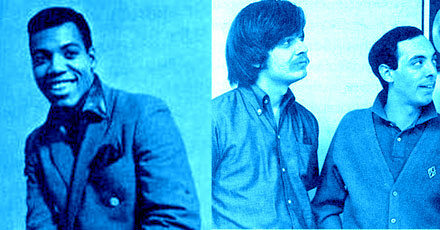 Check out the interview on 60s Garage Bands for more of the story. What happened after that is a testament to what a ‘factory’ the Kasenetz-Katz organization was. Having had a taste of success with ‘Beg Borrow and Steal’, and deciding music could be extruded upon the charts like so much baloney, they kept on releasing Ohio Express records , first using yet another “real” band, Sir Timothy and the Royals to tour and (to a much lesser extent) record, and then eventually dropping the band conceit entirely and ceding the brand/entity to none other than bubblegum maestro Joey Levine and various and sundry studio musicians. The end result being, that the Ohio Express were – in the long run – no more real than the Archies or the Groovy Goolies. Certainly not unheard of in the 60s (or even today) but a more Gordian knot than most. The Ohio Express ‘brand’ kept on churning out records into the early 70s. I hope you dig the track, and I’ll see you all next week with a new episode of the Iron Leg Radio Show. Here’s a weird one for you. A long time ago – at least 15 years – I was out searching for records at one of the less likely, far afield digging spots on my list, and I pulled one of the strangest, oddly unsettling picture sleeves I had ever seen (which you are now, also seeing..BOOYAH!). Anyway, my stack was already large, so I slid it back into the pile, where it no doubt scared someone else later on. That picture sleeve was lodged in the catacombs of my brain ever since. Flash forward to earlier this year, a buddy of mine has a copy of the same, creepy-looking record in his sale list, with a sound clip. My sunshine pop senses being much more highly developed these days, I gave the clip a spin and dug what I heard, so I put in my bid, and before long the record was mine. 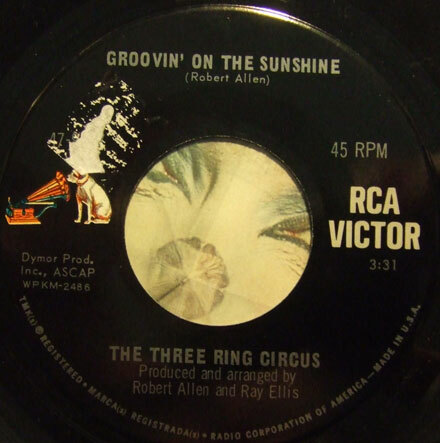 The group, The Three Ring Circus (thus the scary clown…), which all available evidence suggests was a product of “the Man” trying to coopt the psychedelic vibe, was the brainchild of songwriter Bob Allen, who had written some big hits for Johnny Mathis. Musically, the record is actually very cool indeed, sounding like the intersection between the Free Design, the Neon Philharmonic and the Banana Splits. 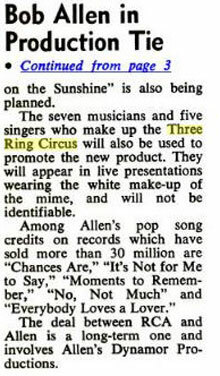 There was actually an entire album recorded by the Three Ring Circus, on which one side was vocal and the other instrumental. Bob Allen went on to write and produce an album for Bob McGrath from Sesame Street, which also included a cover of this very tune. Around the same time, the Tokens recorded and released a medley of ‘Groovin’ on the Sunshine’ and – dig this – the Sesame Street theme! 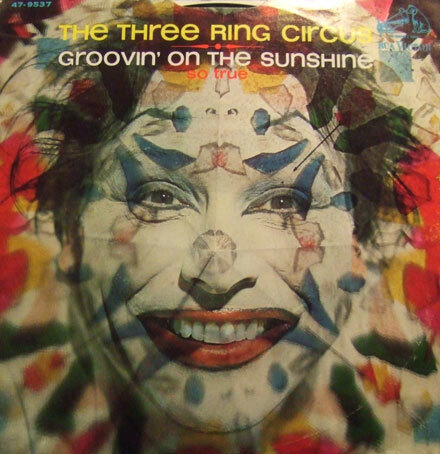 I, for one will be on the lookout for a copy of the ‘Three Ring Circus’ LP.